Why you run: I love the freedom of being able to get somewhere on my own accord (please disregard any fancy gear you may see me wearing). It’s reassuring to me to know that no matter how Metro or traffic are looking, I can always get home. Also, I love medals. When did you get started running: I was a devout non-runner until shortly before turning 30. A few months before my birthday, I figured that if I had to turn 30, I might as well be awesome and started running. Note: 30 is nothing now. Have you taken a break from running: I took about 10 months off in 2016-2017, when I was pregnant with twins. The boys were having none of the running, and I happily obliged. Coach or training group: I’m part of an international running collective that began as a group for folks running the 2013 New York City Marathon. Five years on, it’s blossomed into lifelong friendships. It’s a joy to travel to a race in practically any part of the world and have a friend to run with or in the crowd cheering. 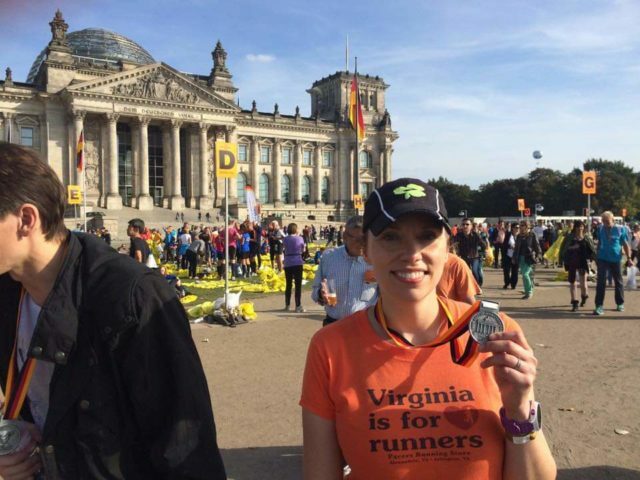 The hardest race you’ve ever run: The Berlin Marathon. When people suggest you schedule your trip to do the sightseeing after the race, please listen. Most adventurous decision you’ve made with your running: Joining my online running group. You never know what you’re going to get with strangers on the Internet, but it truly changed the course of my life. I’ve travel to places I’d never considered going, said “why not?” to more things, and done more marathons than expected. My favorite place to run in the D.C. area is: Along the river between Georgetown and the Mall. Can you beat that scenery? My best race was: The New York City Marathon in 2013 (PR) and the 2017 StarKid 5K. StarKid was my first race after pregnancy, and it benefited the children’s hospital where my son had spent time in the NICU. It wasn’t my fastest or easiest by far, but it was the best for my heart. Favorite local race: We have so many great races here, it’s hard to pick just one! My favorite vacillates between the Crystal City Twilighter (vibe), Fairfax Four Miler (vibe, pizza, and an early night in), Clarendon Day Double (the rushed slog up the hill between races), Parkway Classic (scenery), and the Turtle Trot (turtles). Favorite flavor of gel, gu, etc: Blue Clif Bloks. Blue’s a flavor, right? Goals: Short term: Get back to longer distances. My runs have been shorter since having kids. Long term: Get a World Marathon Majors Six Star. Extremely long term: Qualify for Boston at 80. Your advice for a new runner: Being a runner is more of a mindset than a speed, distance, or build. If you run (whatever that looks like for you), you’re a runner, and you’re a vital member of the community. Put aside any feelings of inadequacy that you have and just get out there. Favorite running book: In a Dark, Dark Wood by Ruth Ware. It’s not a running book per se, but running’s a major factor in it. Have you dealt with a major injury: Does twin pregnancy count? My first run back was six weeks after my sons were born. It was such a trip – it felt like running on someone else’s stilts. Why is the D.C. area a great place to be a runner: Between the routes and our vast running community, you can get a fun and memorable solo or group run in any day of the week.